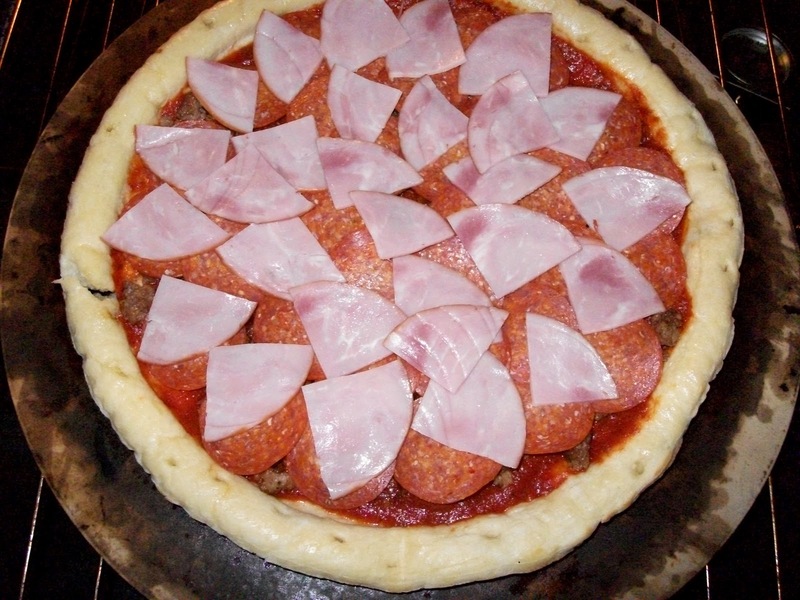 Ok ya’ll, today I am going to show you just how easy it is to make pizza at home. Everyone in my house likes different toppings on their pizza, so it just plain easier to do it at home. First thing you need is a crust. This can be accomplished several ways. You can go through the trouble of making homemade crust (If you have the time and inclination), you can purchase a dough ball or two from your local pizzeria or simply buy a pre-made crust from the grocer. Tonight we are going with the pre-made crust from the store as it is the night before Thanksgiving and I have enough to do. One trick I have learned that makes a pre-made pizza crust pop is using a pizza stone when you bake the pizzain your oven. I also like to rub the pizza crust all over with a light coating of good olive oil before adding the sauce and toppings. Speaking of Sauce, you have the same options as above for your sauce. In essence of saving time I chose the pre-made sauce. 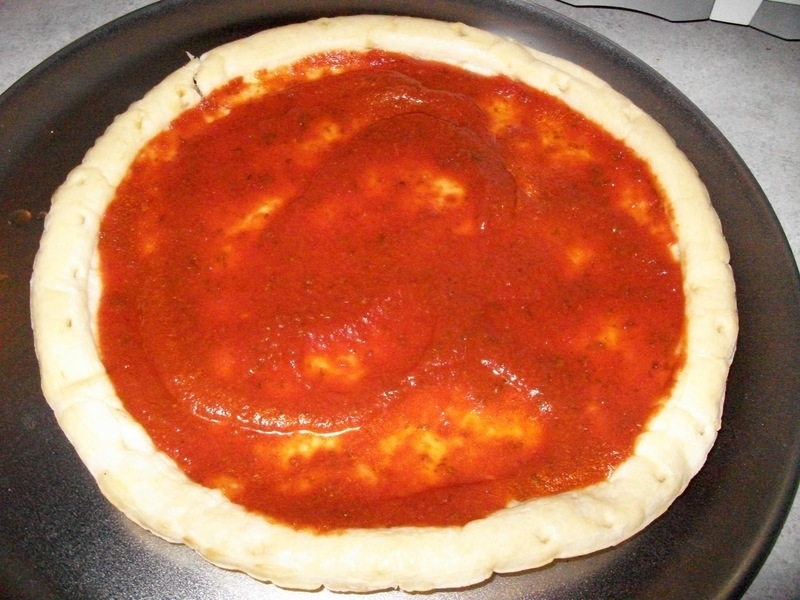 Sauces may be a traditional red, three cheese or even an Alfredo white sauce. When it comes to toppings you can go crazy or just create a simple cheese pizza. When selecting cheese just be sure that you pick a cheese that melts well. I would suggest mozzarella, provolone, monterey jack or a mix. I would not suggest straight cheddar as it just doesn’t met the way it should on a pizza. Topping possibilities are as limited as you imagination and budget. 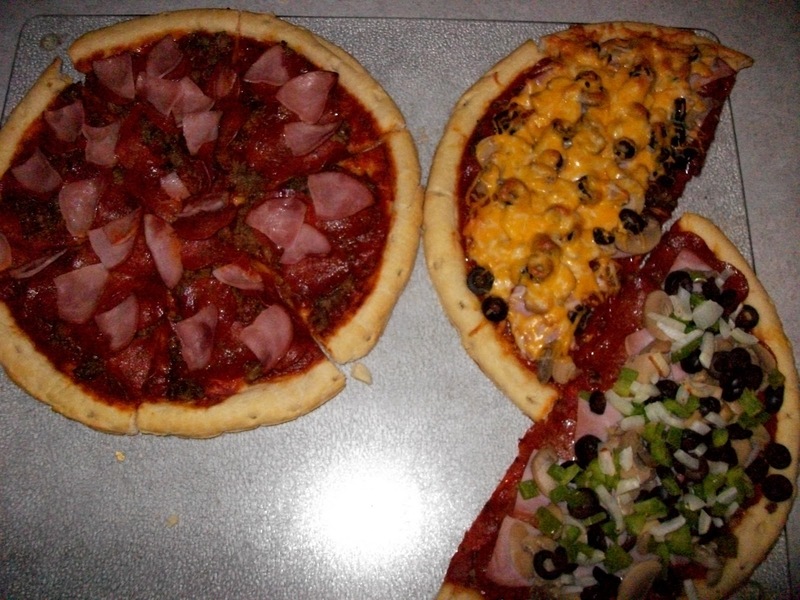 For our Pizza this evening I will be making three types of pizza selections on two crusts. My daughter only like meat on her pizza so she will have sausage pepperoni and canadian bacon. Ashlyn does not like cheese at all so she gets no cheese. Hubby, Scott, and I like the same, but with more toppings we both like black olives, and mushrooms. I like to add bell pepper and onions to mine while Scott just adds cheese. 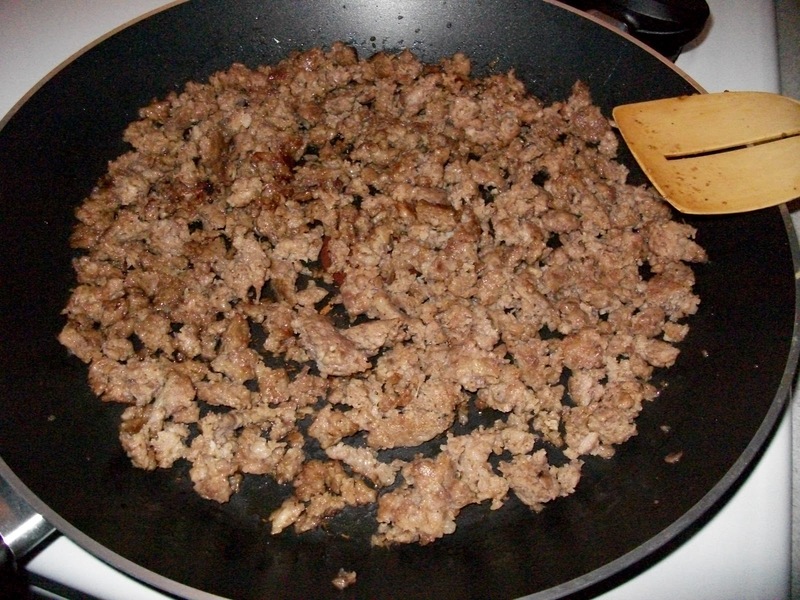 The only real cooking involved here is cooking such toppings as sausage, bacon, chicken, turkey or ground beef topping. These can all also be purchased pre-cooked at the supermarket if you need more time saving help. To start our pizzas I brown the sausage in a skillet. Please make sure to thoroughly cook your meats. Raw meats are dangerous to your health. The pizza will not be in the oven long enough to cook any meats that are not done already. Ok, so while our pizza stone is warming in the oven oils your crust and add your sauce. Then start adding the meat topping first if using.I started with cooked sausage, then pepperoni and topped it with Canadian bacon. This makes Ashlyn’s pizza ready for the oven.350 degrees for 11 minutes or desired doneness. The finished product. 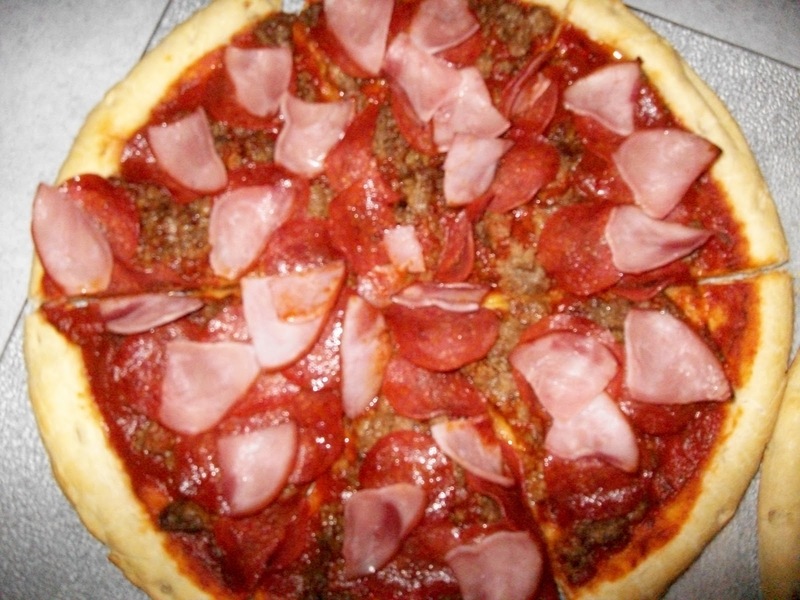 So simple anyone can make home made pizza anytime at home. Be creative, try a few or multiple toppings the choice is yours. Have a great day.